La-La Land Records, Sony Music and Warner Bros. proudly present the 3-CD presentation of legendary composer Henry Mancini’s (THE PINK PANTHER, BREAKFAST AT TIFFANY’S, A SHOT IN THE DARK) glorious original motion picture score to the classic 1965 comedy THE GREAT RACE, starring Jack Lemmon, Tony Curtis and Natalie Wood, and directed by Blake Edwards. 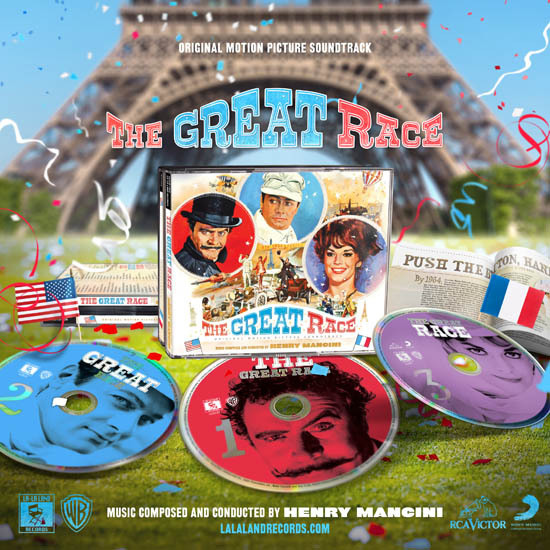 Disc One and Disc Two feature the World Premiere release of Mr. Mancini’s original film score, (in stereo) while Disc Three presents the original, 1965 re-recorded LP album tracks, remastered. Produced and assembled by Neil S. Bulk and re-mixed and mastered by Mike Matessino, this very special limited edition release of 2500 units features exclusive in-depth liner notes by writer Jeff Bond and epic art design by Jim Titus. Finally, a deluxe release worthy of one of the most magnificent comedy scores of all time! Push The Button and get yours now!